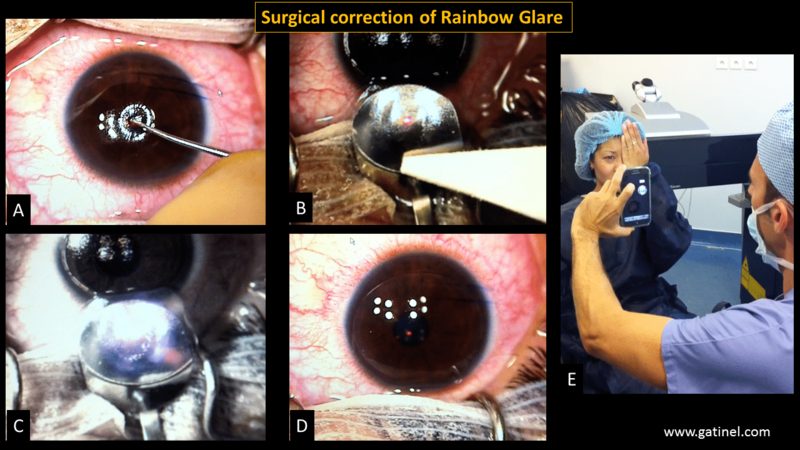 Rainbow glare is a rare mild optical effect of femtoLASIK surgery. 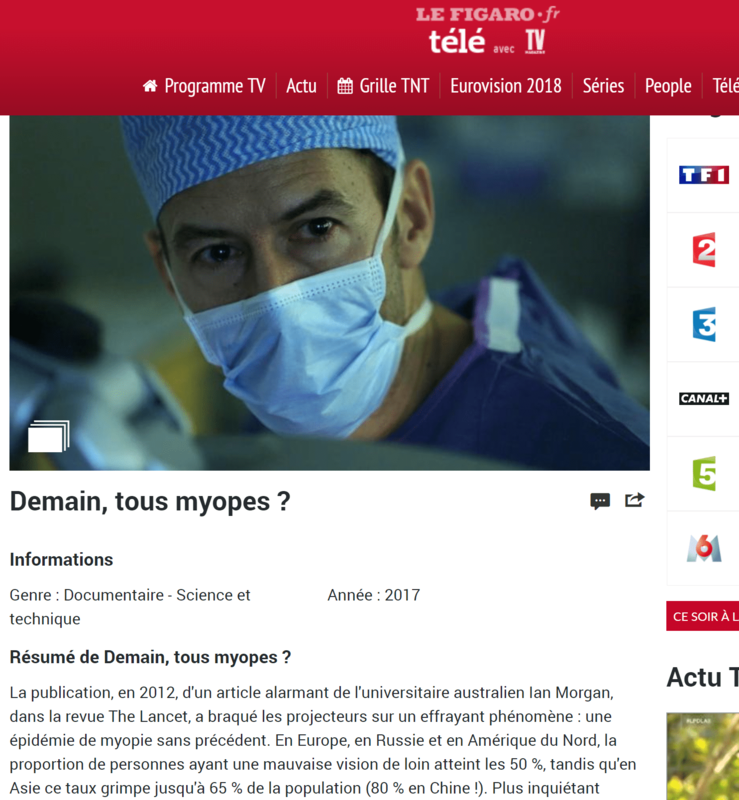 This page is dedicated to its description, causes, and surgical correction. Rainbow glare is a rare optical side effect of femtosecond LASIK. It was first described in 2008 by Krueger et al. It affects a very few proportion of the patients that benefit from femtosecond LASIK technology to become spectacle and contact lens independent. Rainbow glare is usually transient, but may take some months to disappear. In some rare cases, it leads to persistent and disturbing visual symptoms, on which this page will focus. Femtosecond laser technology to create the corneal flap (which is specific to the LASIK technique) was introduced about 15 years ago. It has progressively replaced the conventional microkeratome (blade cut of the flap) in the hands of most high volume refractive surgeons. Patients affected by rainbow glare describe seeing a spectrum of colored bands proceeding in rainbow-like fashion. The effect is most prominent in the dark when looking at pinpoint light sources, such as oncoming automobile headlights at night. When looking at monochromatic sources (for example a green neon or traffic light), lateral and vertical “ghosts” or replications or the source can be perceived. Some of the patients have drawn with pencils or image softwares their subjective visual perception. Typically, each radiating band contains a typical rainbow-spectrum color pattern, extending from violet– blue, to red at its outermost extent. In addition, some patients report a slight blurring of their vision. The typical halos that may be reported after laser refractive surgery are different from the rainbow glare related visual symptoms. Typical halos look like a “spread” of the light emanating from the source, without any free interval. There are no distinct clear color fringes, although some slight colored scintillation may be observed at the edge of the halo zone. In rainbow glare cases, patients describe sharp colored radiating symmetrical halos extending laterally and vertically around bright light sources, from which they are separated by a free interval. These disturbances are usually seen with one eye only : in most of the reported cases, rainbow glare is unilateral or much more pronounced in one eye than in the other one. The greatest perceived spectral intensity is noted when bright white light sources are visualized against a dark or uniform background. At day time, rainbow glare may not be perceived. 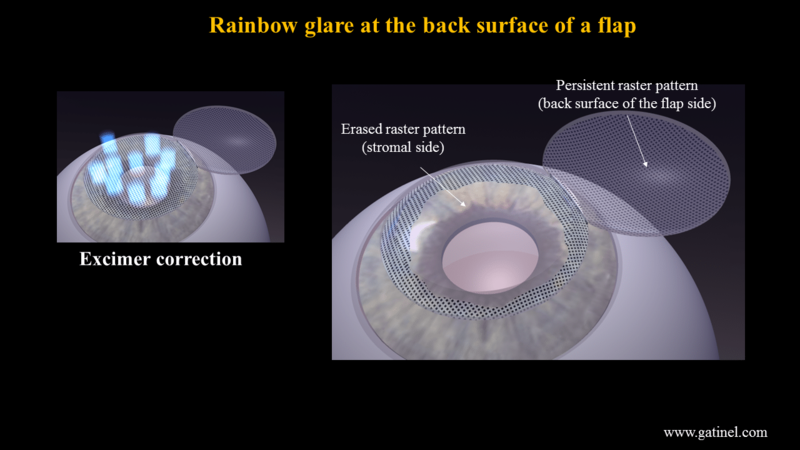 The cause of the rainbow glare was initially thought to be the diffraction of light from the grating pattern created either in the stroma or on the back surface of the LASIK flap after femtosecond laser use. Interestingly, rainbow glare may be the only medical and ophthalmic syndrome which is specifically caused by a pure diffractive mechanism. The femtosecond laser spots are delivered in a raster pattern and are spaced very evenly. This is indeed the very even spacing of the spacing which causes the incoming light to diffract. Diffraction is typically involved to explain the bending of light around the edges of an obstacle. In classical physics, the diffraction phenomenon is described as the interference of waves. Diffraction is very wavelength dependent; it occurs whenever light encounters « something » (particles, grating, striaes, slits etc.) which has a repetitive motive and dimensions close to the dimension of light waves (microns). The pattern of incoming monochromatic light after it has been diffracted by a small hole is the classic « Airy disc » (the smaller the hole, the larger the disc). The famous Young double slit experiment, in which light is splitted into separate waves with various phase shifts creates a typical interference pattern. Eventually, diffraction phenomena and light wave properties are also « used » to conceive diffractive intraocular lenses, on which some little steps of a few microns can provide the separation of the incoming light in various focii. In rainbow glare, light is diffracted by each of the impact zones. These zones represent a pattern of repeated and evenly spaced « optical disturbances », where the stromal tissue exhibits some different optical propertie than the surrounding un-impacted zone. 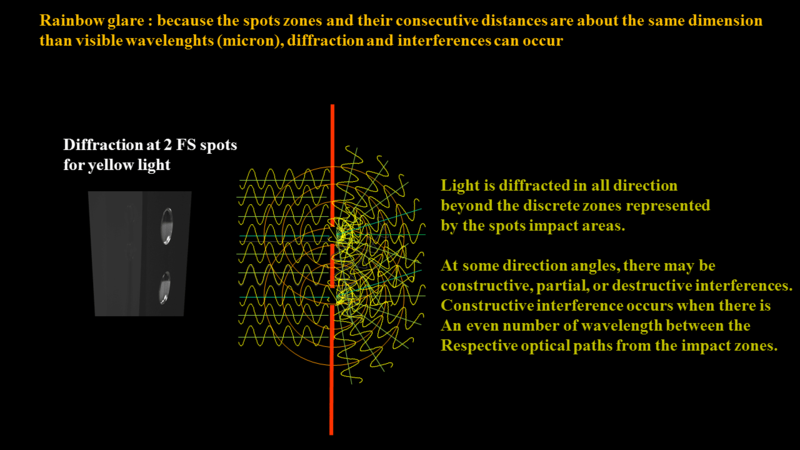 Each spot zone diffracts light and act as if it was a « discrete » light emitter, spreading light in all directions beyond. At some specific angle, which values depends of the spots spacing and considered wavelength, constructive interference will occur. 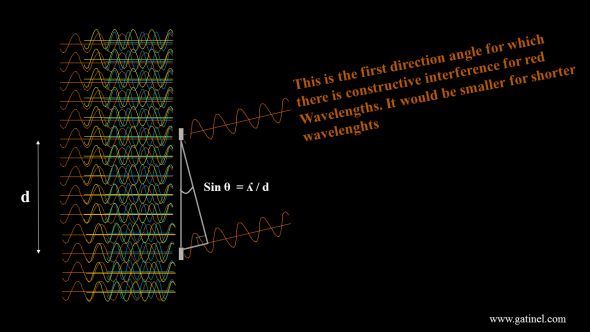 Destructive interference (phase shift of half a wavelength) occurs for half the value of that angle. Given the geometrical relationships between the light waves and the FS laser raster pattern, constructive and destructive interference will form at a specific angle, which will vary with the considered wavelength. White light comprises a mixture of the wavelength present in the visible spectrum. Diffraction at the spots causes the different wavelengths to separate. Because of this mechanism, which arises at the spots impacts plane, there is an obvious relation between the spatial distribution of the spots and the perceived diffraction pattern, which will be detailed later. Rainbow glare has been initially reported after femtosecond LASIK using Intralase IFS 15 and 60 KHz (Abbot Medical Optics). We have reported the first case of rainbow glare consecutive to femtoLASIK with a new-generation femtosecond laser FS 200 (Alcon Laboratories Inc). The quality of the focused beam and numerical aperture of the focusing optics has been invoked to be the most significant factors in minimizing the diffractive dispersion of light that leads to this symptom. It is however intriguing that the occurrence of the rainbow glare symptoms is commonly unilateral, despite identical energy and spot separation parameters for the right and left eyes. In the clinical cases that we could analyze, the images taken by the femto-laser camera after the flap creation were suggestive of a accentuated raster pattern for the shot delivery in the involved eyes, whereas it was not apparent in the contralateral eyes. How this immediate appearance after the interface creation relates to the occurrence and persistence of the symptoms remains to be elucidated. 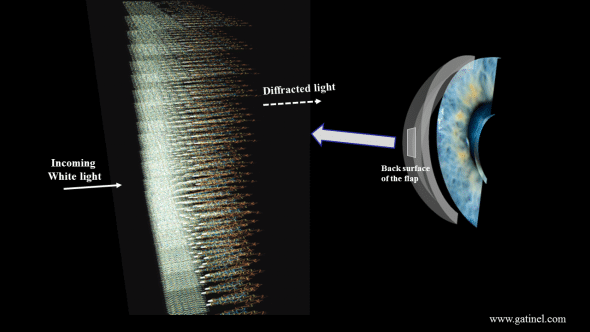 Whereas the risk factors of rainbow glare remain obscure, the presence of hyper-reflective shot pattern with confocal microscopy examination reinforces the hypothesis that the uniform array of periodically aligned photodisruption defects acts as a likely source of the grating pattern, resulting in diffractive light scatter. In femtoLASIK surgery, the flap is lifted after being cut by the femtosecond laser, and the correction is delivered using the excimer laser on the exposed stromal surface. The correction of the refractive error incur the etching of some stromal tissue (a lenticule of tissue is photoablated). On the other hand, the back surface of the reclined flap is not exposed to the excimer laser. The excimer laser spots probably smooth out the raster pattern of the FS spots at the plane of the stromal surface of the cornea. However, the FS laser spots imprint could persist on the back surface of the LASIK flap. Hence, it is believed that rainbow glare is caused by the grating pattern created on the back surface of the LASIK flap by the femtosecond laser exposure. A diffraction grating represents an optical component with a periodic structure, which splits light into several beams with a specific direction. The directions of these beams depend on the spacing of the grating and the wavelength of the light. The grating acts as the dispersive element. In rainbow glare the incident light is refracted and diffracted by the back surface of the flap (within the corneal wall when the flap is in place) on his way from its source to the retina. The gratings created by the very evenly distributed femtosecond laser spots are of ‘transmission’ type. The diffracted light is composed of the sum of interfering wave components. The wave components depend in turn from the spectral composition of the light source. The intensity of the pattern created on the retina is the result of the combined effects of interference and diffraction. It is common to assign a number to the principal diffracted beams of light, which are also called “modes”. A diffraction grating has a ‘zero-order mode’ (where m=0), in which there is no apparent diffraction: a ray of light behaves according to the laws of refraction. 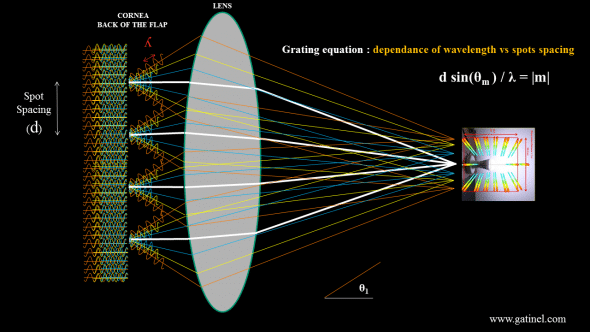 The relationship between the grating spacing and the angles of the incident and diffracted beams (non zero order modes, m ≥1) of light is known as the grating equation. When light is normally incident on the grating, the diffracted light will have maxima at angles θm given by this equation: d sinθm / λ = |m| where θm is the angle between the diffracted ray and the grating’s normal vector, d is the distance from the center of one slit to the center of the adjacent slit, and m is an integer representing the propagation-mode of interest. Schematic depiction of the rainbow glare global mechanism, for the 1st order of diffraction of incoming white light, which accounts for the « first » lateral band of rainbow glare. Similar constructive interference may occur at a larger angle (2nd order of diffraction). The « zeroth » order of diffraction receives the most energy, and correspond to non deviated (just diffracted light). Because this light is not deviated, it remains spectrally homogeneous and « white ». The grating equation is useful to predict the location of the perceived color fringes, and their distance to the light source. Looking at a white-light source positioned at a distance of 1 m in a dark environment, the spectral bands for red extended from an apparent distance of about 10 cm for grating pattern spacing of about 8 microns. 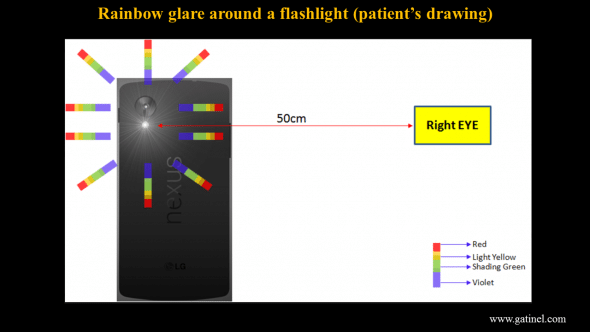 Patient’s representation of its rainbow glare when looking at a bright light source (smartphone flashlamp). A transparent plastic calibration disc can be used to receive the pattern of a 9 mm diameter flap cut. We used the Wavelight FS200 femtosecond laser, and a 8×8 micron line/spot separation (the energy of the spots were slightly increased to take into account the rigidity of the plastic material). This transparent disc bearing the raster pattern can be placed against the objective of a smartphone camera. 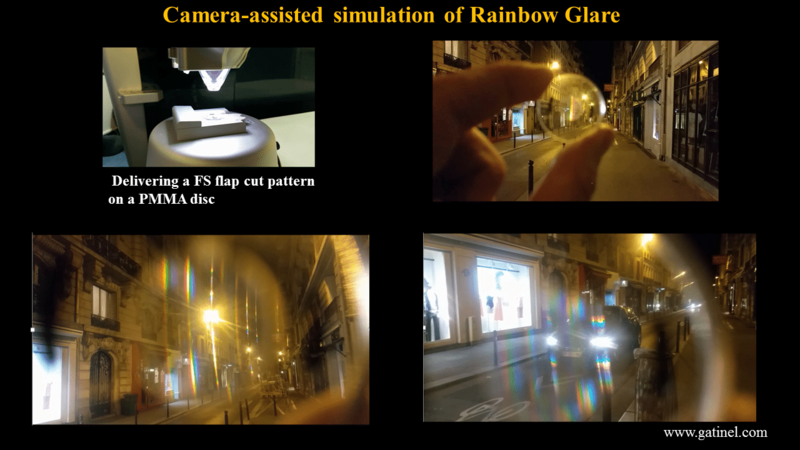 The incoming light captured by the smartphone camera is diffracted at the plane of the spot impacts within the plastic disc, which is interposed between the light source and the smartphone’s objective. This experience helps to visualize the dramatic effect of the light diffraction occurring in rainbow glare complicated LASIK cases. Pictures taken through the FS treated plastic disc in Paris at night time. The rainbow glare patterns are particularly pronounced around the cars front lights. 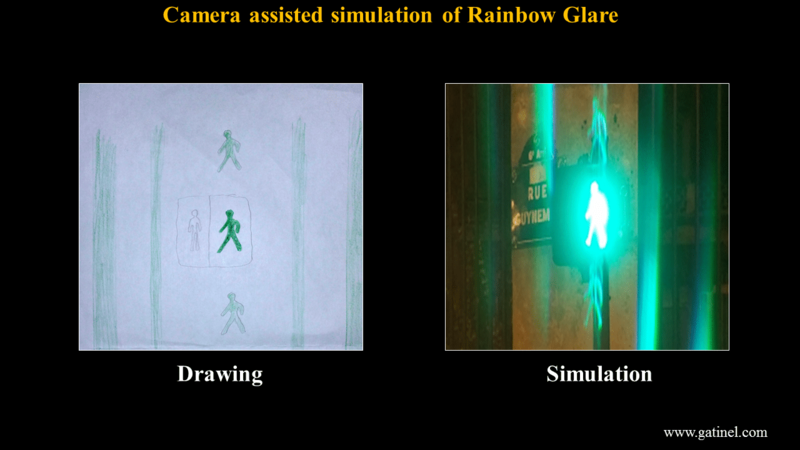 On dimmer or less poly-chromatic lightings, rainbow glare can still be causing disturbing visual symptoms, such as the ghosting of bright traffic or pedestrian signs. 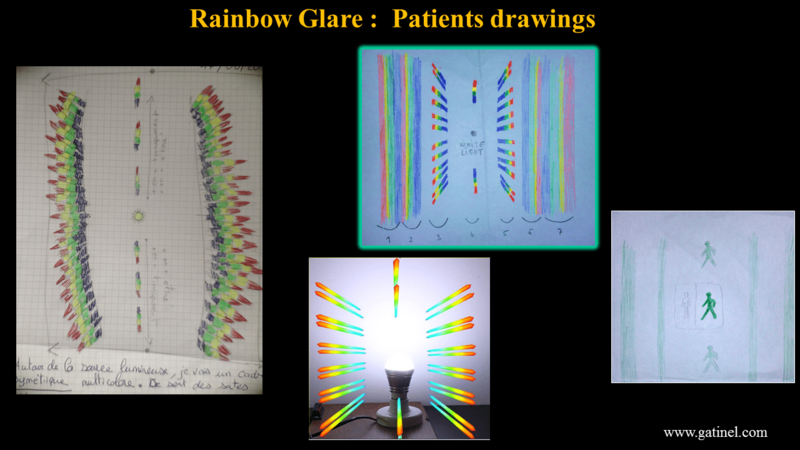 Replication of the visual symptoms depicted in a drawing by a patient affected by rainbow glare. Can rainbow glare be treated? In most cases, rainbow glares vanishes within weeks or months after the LASIK surgery. In very rare cases, it may persist and cause the patients to stop driving at night, or develop anxiety. It is important for the clinician to make a proper diagnostic. I have met a patient who was sent 2 weeks in a psychiatric hospital, since it’s verbal depiction of his symptoms led the unaware ophthalmologists (and later his shrine) to conclude that he was suffering from spectacular visual hallucinations. We had reported the presence of a visible raster pattern at the interface after femto-assisted LASIK flap creation, using confocal microscopy (hyper-reflective spots have also been observed after femtoLASIK in asymptomatic eyes). These features are attributed to tissular response of the femtosecond laser impacts at the posterior side of the flap, and in each of the cases we could document, hyperreflective spots were visible using confocal microscopy at the interface level. Images of the femtosecond laser flaps after their creation (top). 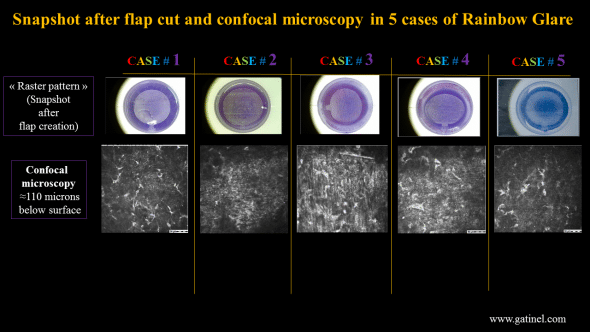 Confocal microscopy at the flap interface, where hyper-relfective spot zone are clearly visible (presumably located at the back surface of the flap). Erasing the evenly spaced singularities created by the impacts of the spots at the back surface of the flap seemed to be a logical and reasonable option to alleviate the patients with their persisting and debilitating symptoms. Unfersurface ablation was described as an adjunct technique for LASIK enhancement in the case of too thin residual stromal bed, and we had experience with this technique in a reasonable amount of cases. This validity of this hypothesis has been demonstrated by us since we have reported the first case of successful rainbow glare surgical correction using undersurface ablation of the flap for LASIK retreatment of low residual astigmatism. Since then, we have successfully treated two other cases of persisting and severe rainbow glare. In the first performed case, confocal microscopy of the right and left corneas were obtained using the HRT II confocal microscope. On the right cornea, multiples rows of hyper-reflective spots appeared at about 125 microns below the anterior corneal surface. The horizontal and vertical distances between these zones matched the distance between spots and lines programmed in the FS200 laser (8μm). At 6 months postoperatively, it was decided to attempt to correct the persistent residual astigmatism and rainbow glare symptoms by performing undersurface ablation of the LASIK flap. A gentian violet pen was used to mark the center of the pupil on the cornea before flap lifting, and turning it back. The patient was asked to look downward and the excimer laser delivered the astigmatism correction on the stromal portion of the flap. Legend : A : The right eye was draped in a sterile fashion, care was taken to keep the lashes out the surgical field. The peripheral corneaand the corneal center of the entrance pupil were marked with a blunt tip stained with a gential violet solution. B While the patient as asked to look downward, the hinged anterior corneal flap was temporarilly elevated and reclinated on a flat domed spatula using a Merocel sponge. C The eye tracker of the EX500 excimer laser as deactivated, and the photoablation was delivered on the stromal bed, manually centered on the entrance pupil center mark. D the laser-treated corneal flap was replaced on the cornea, and the interface irrigated with balanced saline solution, before the flap was painted bath into position with a wet Merocel sponge. E : Before and after the completion of the procedure, the patient was asked to describe her visual perception by looking at a bright light white source. The typical rainbow glare pattern was present before the surgery but had disappeared immediately after. Immediately after the procedure, a white flash light was shone at 50 cm from the patient’s right eye. The rainbow glare pattern was no longer perceptible. At day one and day 30 controls, uncorrected visual acuity was 20/20 with the right eye, and the rainbow glare pattern perception did not reoccur. Rainbow glare is a post-LASIK optical side effect primarily caused by the diffraction of light. It is caused by the grating pattern created on the back surface of the LASIK flap after femtosecond laser exposure The diffracted light is composed of the sum of interfering wave components, and the intensity of the pattern created on the retina is the result of the combined effects of interference and diffraction. The risks factors for rainbow glare are not well understood. Simultaneous correction of residual myopic astigmatism and rainbow glare proves that the grating pattern on the back surface of the LASIK flap causes rainbow glare. Our therapeutic success suggests that undersurface photoablation of the LASIK flap may be an effective method to reduce the symptoms related to rainbow glare. In eyes presenting with persistent and visually impairing rainbow glare symptoms, the deliverance of a planar ablation (e.g. phototherapeutic keratectomy) on the stromal side of the LASIK flap is also be a valid option which we used in a further successful retreatment case. Gatinel D, Saad A, Guilbert E, Rouger H. Unilateral rainbow glare after uncomplicated femto-LASIK using the FS-200 femtosecond laser. J Refract Surg. 2013;29(7):498-501. Maldonado MJ. Undersurface ablation of the flap for laser in situ keratomileusis retreatment. Ophthalmology. 2002;109(8):1453-64.